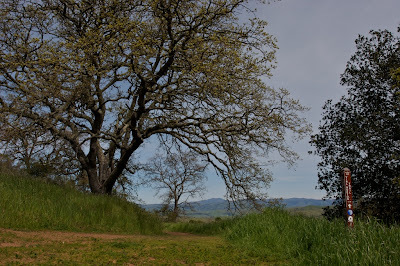 The Mockingbird Hill to Bull Run loop is a challenging 7.5 ramble through most of the highlights of Quicksilver Park. The hike is quite exposed and best attempted in the Winter or Spring. Beginning at the Virl O. Norton trailhead located on the back side of the Mockingbird Hill parking lot (away from the obvious trailhead) the hike follows the park boundary skirting some ranch style homes. Fortunately the trail quickly breaks away wandering deeper into the park while climbing in elevation. 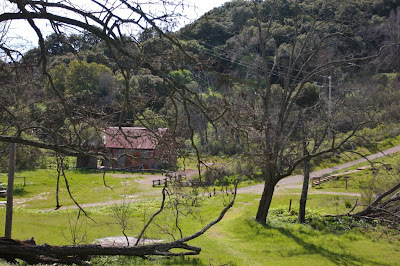 The trail climbs very steeply passing whole fields of Poison Oak as well as some sparse Oak Trees. Small yellow flowers along the Virl O. Norton trail. 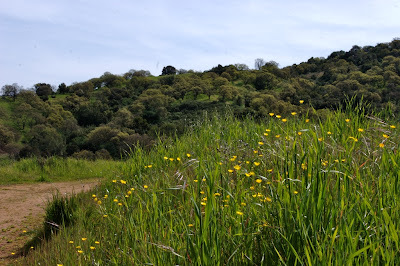 The trail remains very exposed on the climb until it Junctions with the Hacienda Trail which splits in two directions, one runs out to the New Almaden entrance to the park and the other cuts back to the right towards the Capehorn road. Looking back on the Virl O. Norton trail from the Hacienda trail junction. Hacienda runs through a phenomenal stretch of the park featuringing some prestine Serpentine grasslands and outcroppings. These fields bloom with California Golden Poppy in the spring and offer great views of Loma Prieta (the mountain epicenter of the 1989 earthquake). Hacienda offers a nice break from the early climbing. California Golden Poppies nestled in Serpentine outrcoppings, Loma Prieta in the background. A left at the Capehorn Pass trail junction runs towards the heart of the park leads towards a 4 trail junction. I followed the Mine Hill trail up towards English Camp however taking the Randol Trail would offer a shorter but still satisfying loop. Mine Hill trail immediately begins the climb a dusty wide fire road. The climb is moderate but consistent for several hundred feet of relatively monotonous terrain. Views of the Silicon Valley are available off to the right but obscured by trees. A left at the next trail junction leads to English Camp a remnant of the old New Almaden Mercury Mine which was once the 2nd largest in the world. 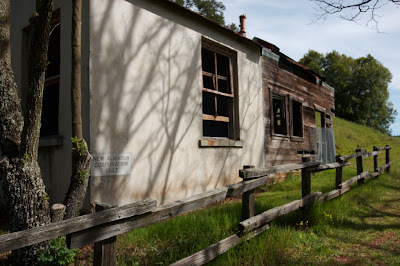 Decaying buildings are scattered around the English Camp site, this area is worth a short stay and exploration. The buildings themselves are all roped off. Besides being completely structurally unsound they are the home to rodents, and as signs warn some of these carry the rare Hauntavirus, so it's best to stay away. After a breather at English Camp I decided to extend my hike by backtracking towards the April Tunnel which coincidentally is somewhat unrewarding. Next time I would depart directly from English Camp up the Castilero trail which offers views of both Mt. 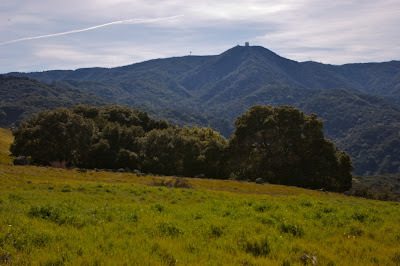 Uhmunum and Almaden Reservoir. Either way some more light climbing needs to be done over a mile or so to reach Bull Run. 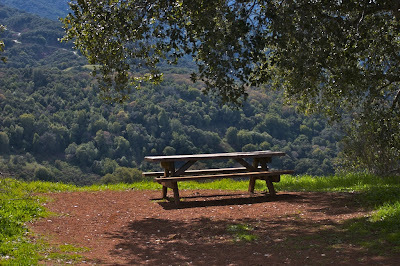 Bull Run is a horse trough and offers a lovely bench with a great view of the Sierra Azul (southern Santa Cruz mountains). Quietly the hike has gained about 1,500ft of elevation so far. Fortunately Bull Run is the high point of the park and its all down hill from here. The Mine Hill trail trail traverses the crest ridge of Quicksilver after passing Bull Run. The entire hike offers great views of the mountains to the west consistently for the next couple miles until the next trail junction. The view from the mine hill trail along the top ridge is consistently beautiful. 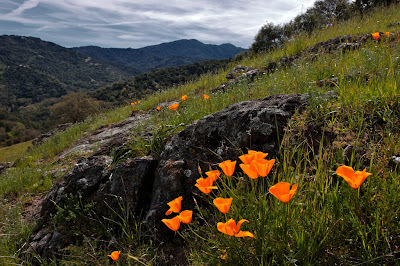 At the Prospect #3 trail junction there is another pristine serpentine outcropping, bursting with poppy's in the spring. Prospect #3 is also the route back to the trailhead. The trail descends steeply through intermittent oak forest, and manzanita chaparall eventually landing at a small park bench where it junctions with the Randoll trail. The small landing offers impressive views of the Bay Area and is worth a short stop. 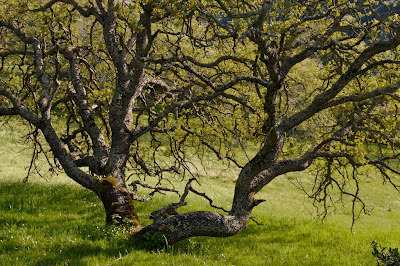 The occasional Oak tree is all that breaks up a large grassy hill. After the bench the trail continues down on its steep descent back towards the trailhead. 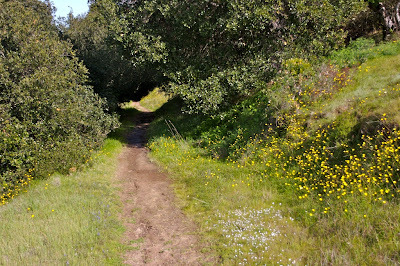 It also becomes narrow at this point and if conditions are right expect poison oak to creep in over the trail about ankle-high. I ended up making a nervous and slow descent thanks frequent near brushes with the plant. Budding new leaves light up in the afternoon light along the Prospect #3 trail. Prospect #3 dead ends in to the New Almaden Trail which is for the most part a shady and thickly forested trail. The occasional opening is mostly studded with wildflowers. The remaining two miles of hiking dip up and down through stream cut valleys along the shoulder of a long ridge. 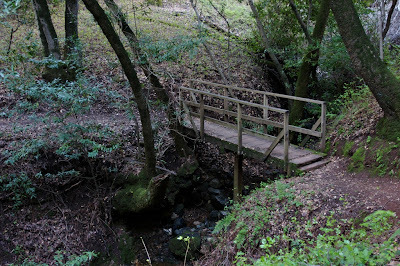 One of many bridges along the last 2.5 miles of the New Almaden trail. It was late in the afternoon when I finally made my way along the last few miles and the sun was shining through the yellow-green new budding flowers of Oaks all over the park. They lit up like lights and simmered with the breeze. Sadly because I had run out of water and was dying of thirst I didn't stop long to enjoy this seight. 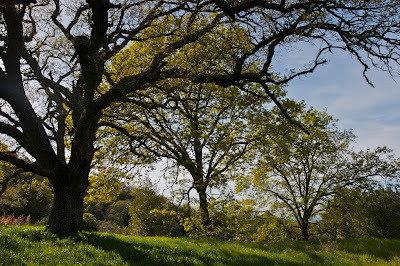 Oak Tree along the New Almaden Trail. The frequent stream crossings were almost intolerable as the sound of running water exacerbated my dehydrated brain. Finally though the New Almaden trail spits out on a Junction with the Hacienda trail again just above the parking lot and then leads back down to the start after just a few hundred feet.